My almost 4 year old has been showing signs that she is interested in learning letters and the sounds they make. 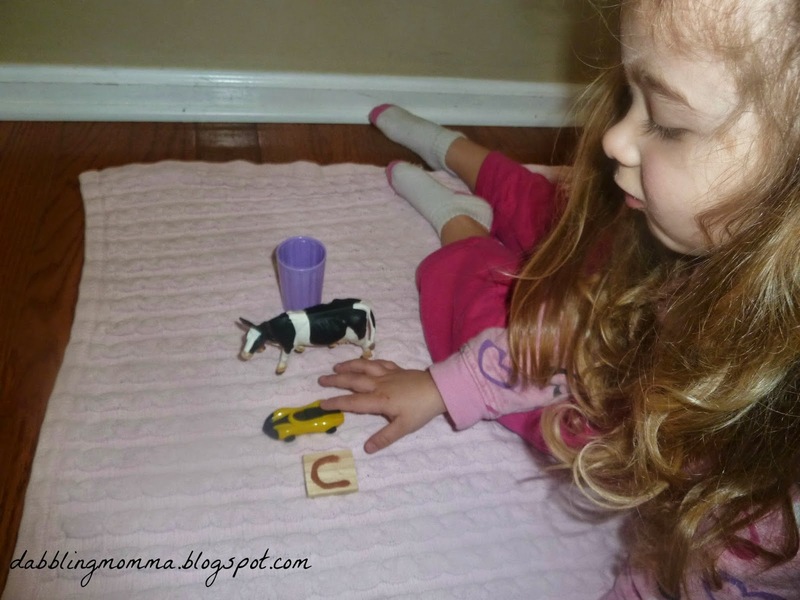 I read about the Montessori way of teaching letter sounds by using sandpaper letters. After reading further about it I realized that for me making the sandpaper letters would probably not turn out great. Personally, I felt I wouldn't be able to pull it off and didn't want to risk putting in the effort for the letters not to turn out as I wanted. The other option was to purchase the sandpaper letters but I was not willing to put out the dollars as they can be a bit pricey. I talked with my husband about what I wanted and he came up with what I thought was a good alternative. Hubby had some scrap wood, I had colored salt that I had used with my daughter in other activities and we have an abundant amount of hot glue sticks for our glue gun. With these supplies we pulled off some Montessori inspired letters. My husband cut the wood pieces then I used our hot glue gun to draw the lower case letters onto the wood. After that I applied some colored salt that I had on hand from a different activity. In this case, the salt acts as the sand paper. I am new at learning about how children learn letter sounds using Montessori teachings but it's my understanding that part of the process is saying the sound and having your child feel/trace the letters with their fingers. The salt seems to be a good alternative to the sandpaper and gives the letters enough texture for my daughter to do the tracing part. If you would like to make your own salt, put some salt in a ziploc bag, add a few drops of food coloring, seal the bag and mix so that the food coloring gets throughout the salt. Here's Tiffany learning our first letter sound, 'c.' We included 3 items that begin with the letter 'c' sound. Their is a great site called Growing Book by Book and if you check out this Youtube page you'll find a song by the blog host of Growing Book by Book that we have been singing even when we are not actually sitting and learning. You can be at the grocery store, driving, walking, anywhere! It's a great song that will help reinforce letter sounds! This is a great idea. I like incorporating texture whenever possible. Engaging the senses really enhances the learning experience. Thanks Jill! I agree totally! We'll see ya tomorrow at the link up! Thanks for the feature, Deborah! Glad you liked it!! This is a good idea. I made an entire set of sandpaper letters, with actual sandpaper on wood but he just tossed them aside after a few attempts! Dunno if it's the feel of sandpaper (even the finest ones pretty course!) or the activity in general! Prop I'll stick yarn over the sandpaper or something and retry after a few months! 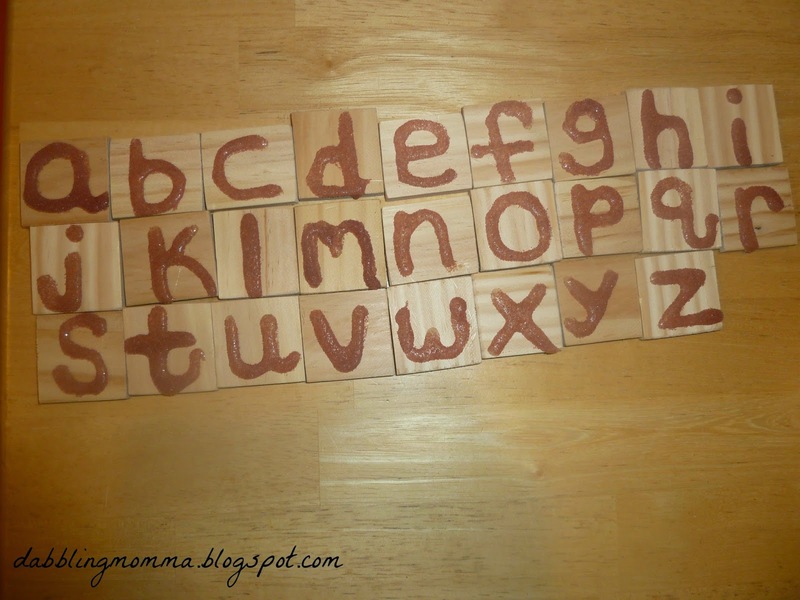 I give the credit to my husband who I think was motivated because he didn't want me spending the big bucks on buying the real montessori sandpaper letters which can be pricey! Glad you like these and easy enough to do!